Helmut Lang blazer-inspired crepe skirt. A.L.C. 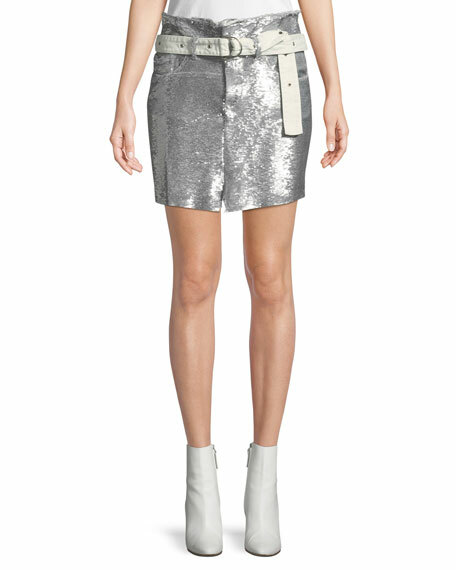 "Baxter" skirt in metallic animal-print. A-line silhouette. Tiered flounce hem. Mini length. Hidden side zip. Silk/metallic. Polyester lining. Dry clean. Imported. 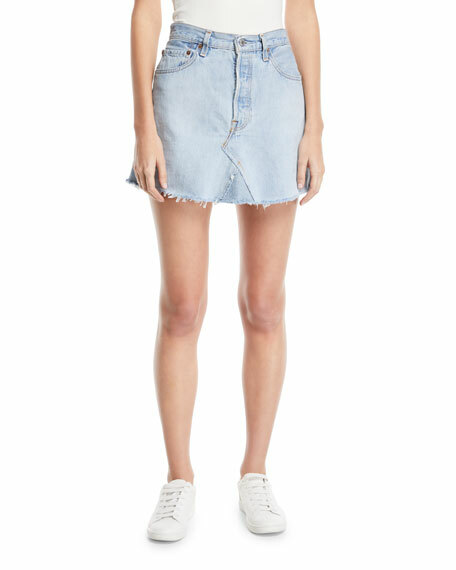 Iro "Natou" sequined mini skirt. Adjustable twill D-ring belt. Natural rise. Hidden fly; belt loops. Five-pocket style. Straight silhouette. Viscose/spandex. Made in Romania. LoveShackFancy mini skirt in gauzy plaid. Approx. length: 15"L from waist to hem, 17"L down center back. Shirred elastic waistband. Ruffled tiers. Relaxed silhouette. Hem hits mid-thigh. Pull-on style. Silk. Imported.